Asetek Inc., based in Denmark, describes itself as "a world leading manufacturer of vapor phase and water based cooling solutions for personal computer systems... designed for PC enthusiasts, gamers and professional users who demand exceptional performance, maximum stability and low noise levels." 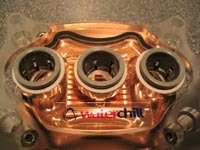 The company got off the ground in 1997 when the founder was challenged to build a faster computer, which eventually lead to the popular VapoChill and WaterChill products available today. 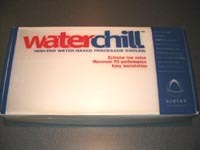 The Asetek WaterChill Power Kit is sold in the corrugated plastic box shown below. All of the components are protected by sheets of egg-crate style foam, but are basically loose inside the box, with smaller items in baggies. With the box open, the first components we will take a look at are the water blocks. The first series of images will take a look at the CPU water block, specifically set up for cooling an AMD Socket 754 processor. 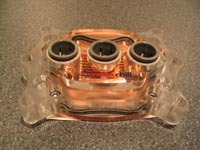 The thick, plastic cap on the copper base is removable and can be interchanged with two other caps provided. The cap shown below is for AMD Socket 754/939/940, but also included with the kit are caps for AMD Socket A, and Intel Socket 478. The below right image provides a decent look at the machining inside the water block, revealing the channels for water to conduct heat away from the copper as it moves from the inlet (center hole) to the outlets (two holes on either side). The fittings on this block, and all connections for that matter, are described as "push on", and are a first for me. I am used to threaded, compression fittings, and was a little skeptical of the sealing ability of these push on fittings. As the name implies, you just slip the included 1/2" diameter tubing into the opening, and push until it is firmly in place. To release the tubing is nearly as easy, as you only need to hold the plastic ring down and pull the tubing out. Doesn't sound like the most secure design, but Asetek is obviously confident in it (and it wound up working perfectly for me, too). The kit includes various mounting bolts, nuts, washers, and springs for the various processors it supports. All require that the motherboard be removed during installation, as the standard sockets will not be utilized during installation. This provides a secure installation, and a solid interface between the CPU and the water block. The below left image shows just how thick this block's two main components are... the clear cap and copper base are both quite beefy! 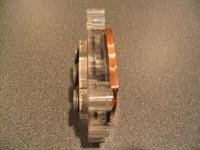 The caps of all blocks seal to the copper bases with a black elastomer o-ring, no doubt custom formed to the unique shapes required by Asetek. 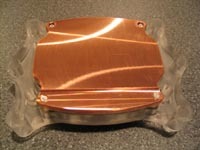 The below right image shows the base of the CPU water block, which reveals that it is quite flat and fairly smooth, with a slight swirling pattern from machining. Dragging the back of my finger nail across all of the water block bases didn't reveal much too get excited about, and a thin film of thermal paste wound up making all of them consistently smooth.